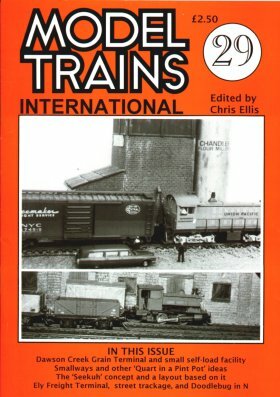 A rare surviving British Freight facility as possible layout inspiration, with location photos and trackplan ideas. Very compact but busy yard layout. The appeal of street-running trains, with prototype inspiration and photos, mainly from Germany. Modifying a Bachmann Tram into a "Doodlebug" motor Car, with real and model photos. Prototype small modern US grain handling facility. Detailing the latest Bachmann Pannier Tank model, with model and prototype photos. How to convert Office Box Files into storage for model trains. A useful table of Diesel axle and bogie measurements for British and American diesel classes.